These holly cupcakes are brightly colored and look fantastic. The red and green sweets teamed with the white frosting are a striking combination. I tend to use vanilla cupcakes but you can use your favorite recipe. Red Velvet and Chocolate cupcakes are also suitable. Split spearmint leaves in half horizontally and gently place on the frosting. Use three jaffas, or other red candy-coated balls, as the holly berries. I like to use red or green paper cases as I think it adds to the festive look. There are also lots of gorgeous Christmas cupcake wrappers available which I think look fantastic. 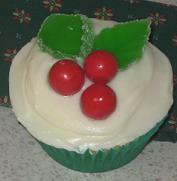 I have a selection of my favorite Christmas supplies available on my Christmas cupcakes page.